Rippled sand dunes sing an eerie chorus. Cactus flowers bloom after a spring rain, jewels against buff-colored earth. Saltbush borders a dry lakebed, and countless Joshua tree limbs reach toward the sky as if in prayer. Mojave is all of these scenes and more -- a bounty for the senses. Summer temperatures often exceed 100 F; yearly rainfall ranges four to 14 inches. Mountains, cinder cones, lava beds, sand dunes and dry lakes attest to the geological forces at work through the ages. Many variables -- elevation, moisture, soil composition, exposure to the sun and shelter from the wind create habitats for plants and animals. Habitats of course, do not have hard boundaries and often overlap. Different habitats may be encountered within a short distance of each other. 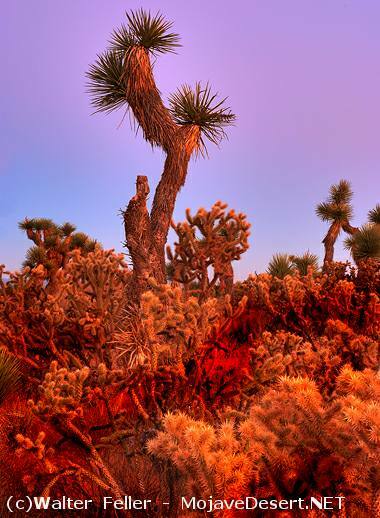 More specific information about the desert habitats described and includes mountain habitats. A somewhat heavy-handed example of a cactus-yucca scrub habitat along the desert foothill slopes of the San Gabriel Mountains in Phelan at evening twilight.